Bahama Backroads villa is one of the few rental properties in the Bahamas with a private tennis court, private dock and various nearby private beaches. There are panoramic ocean sunrises and bay sunset views from the villa. The newly established East Abaco Creeks National Park borders the property which offers fantastic snorkeling, diving, kayaking and of course bonefishing. In the ocean waters easily accessed from the dock world-class sailfishing is on offer as well as mahi-mahi, tuna, grouper etc. Tennis in the morning followed by fishing, sea kayaking, windsurfing, diving, or just plain lounging in the afternoon. Or vice versa. If you want pure rest and relaxation, this is the place. Use of two sea kayaks and two bicycles come with the villa. The house also features a game room with ping pong and table soccer game. A billiards table has recently been added to the upstairs porch. There is also a small gym including weight set and stationary bicycle. Four bicycles and two sea kayaks are included in the rental. 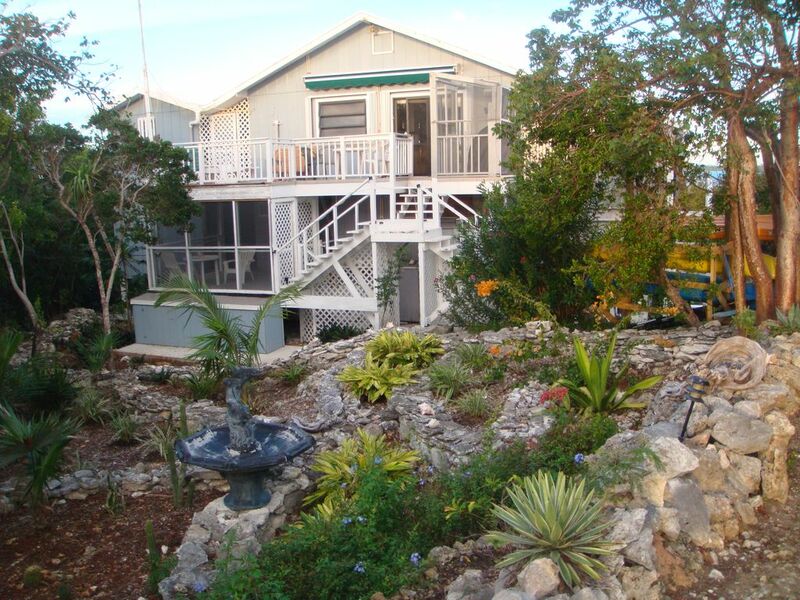 The Bahama Backroads villa, located on two secluded acres of beautifully landscaped gardens, also now includes panoramic deck overlooking the harbor and ocean. The villa also features a separate independent apartment that is available for an extra cost for guests who might have friends or family visitors. Inquire to owner for rates. For golfing enthusiasts The Abaco Club oceanfront golf course is only 10 minutes away and the Treasure Key championship golf course is only a 30-minute drive. Little Harbour is located 25 miles south of Marsh Harbor, where car and boat rentals are available. Forty-minute flights to and from Miami, Fort Lauderdale and West Palm Beach with American Delta, United or Silver Airways. There are numerous nearby beaches within walking distance. The Winding Bay beach is easily reached via bicycle. Cherokee, a charming old Bahamian fishing village, is also nearby and offers a great beach and swimming pier. There is a also great bonefishing in the nearby Cherokee Sound. For birdwatching aficionados the villa is one of the best spots in the Bahamas to see many species including wild parrots that fly by on a daily basis. One of the best ways to tailor your stay at the Bahama Backroads villa is to rent a boat in Marsh Harbour and make the 45 minute journey down through the Sea of Abaco. Along the way there is the Pelican Keys underwater nature reserve where you can tie up to a mooring ball and snorkel. Schools of huge, harmless leopard rays are plentiful in the reserve. There are also various barrier islands that can easily be reached by taking the kayaks from the dock at the house. There are miles of secluded, pristine beaches on those barrier islands. I am a freelance writer who first visited the Bahamas on a sailboat more than 20 years ago and have been coming back ever since. My appreciation of the unspoiled tropical environment that the Bahama Backroads Villa featurs stems from a career writing about environmental and sustainable living issues. Previously I worked for Time Magazine and the United Nations Environment Program and was based in Nairobi, Kenya, where I served as the editor of UNEP's Our Planet magazine. Little Harbour is unique village in an unspoiled tropical environment. Having seen the haphazard, reckless development of so many beautiful seaside resorts over the years it is nice to be able to go to one that is still an oasis from crowds and crass overdevelopment. A typical day starts with a swim and then breakfast on the porch. Later in the morning I try to get in a game of tennis. After doing chores around the house I usually do some reading and otherwise just take it easy. After some late afternoon fly-fishing in the flats in Robinson's Bight, the highlight of the evening is a cocktail on the screened porch that offers a stupendous sunset panorama. Bathroom towels and sheets. Laundromat nearby with washer and dryer. Property measures 2 acres, totally secluded and located on peninsula. Property extends from waterfront to waterfront on a narrow peninsula. We were looking for a nice, relaxed alternative to overcrowded south Florida winter mayhem and gridlock. We found it at the Bahama Backroads villa in Little Harbour. The house is off the grid, private and surrounded by beautiful gardens. The only noise came from a squabbling flock of wild parrots that passed by daily to feed in the surrounding trees. The house was airy, clean,, spacious and every room has a sea view. The kitchen was fully equipped. The barbecue was great for grilling. We relaxed after dinner playing billiards and ping pong. The deck on the hill is spectacular. Every morning we did some yoga exercises and watched as many as 20 sea turtles swam about feeding on the incoming tide. The tennis and basketball courts were great fun. The bay behind the house in Robinson's Bight, which is now a national park dotted with spectacular blue holes, is an incredible estuary that we explored and fished using the kayaks at the house. We snorkeled off the dock as well as on a few local reefs easily accessed from the beach that the owner told us about. Pete's Pub was a throwback to the days when the Florida Keys were a laid-back open-aired outpost We also got a tour of the gallery and foundry led by a entertaining Frenchman who the owner put us in touch with. All in all just a great week. Definitely plan to come back for a couple of weeks in February to get another break from the south Florida mid-winter gridlock. Spent two relaxing weeks at the Bahama Backroads villa. We were two couples. We fished at least a little bit every day. Used the tennis courts. Cocktails before dinner on the porch looking out at a fantastic sunset was a daily highlight. The house is very comfortable. The landscaping is beautiful. The gazebo on the hill overlooking the village and the ocean was a great place to relax. The owner was really helpful. Provided lots of tips including best places to buy food and drink, which was really helpful upon arrival in Marsh Harbour. Also recommended a great place to rent a boat for a few days and told us about some great areas to explore. Looking forward to come back next year. This was our third time at the Villa. Little Harbour is gorgeous and the house really impressive. Spectacular view all around the bay: from the deck we could watch the acrobatic moves of the rays and the sea turtles. Better than a tv show! Great starting the day with a swim and play tennis in the afternoon. We try to come every other year!!! Already planning our next visit. We traveled to the Bahamas primarily to pursue our fishing and birdwatching passions and the villa was a prime spot for both. We could walk the flats for miles or take the kayak to bonefish. We also did some offshore fishing with guide Randy Sawyer who the owner recommended. Randy picked us up at the dock and we caught several sizable mahi-mahi that we later cooked up on the grill. We had plans to travel around the island of Abaco to complete our birding check list but we did not have to leave the property as the place was a prime viewing spot. Very comfortable tropical island-styled house. We had for dinner some old friends who were anchored in the harbor. The kitchen is well equipped and the dining room table spacious enough for a group of eight. The gym and game rooms were used daily. Pete's Pub is special. It is especially nice place for lunch as you can walk to Bookies Beach after eating. The fresh fish platters are excellent. We found a walk around the nearby village of Cherokee to be a trip back in time when the pace of life was slow and simple. The long dock that extends from the village out into the ocean as well as the surrounding flats were a great place to fish and swim from. The one caveat about Little Harbour is the drive from Marsh Harbour at night. We went to Hopetown for a day and stopped in Marsh Harbour for dinner. The drive back in the dark was dangerous as the road has no lights and no middle markers in the middle or on the side of the road. Oncoming cars usually did not reduce their high beams. Next time we will be back before dark for sure. That said, there really is no need to go the Marsh Harbour other than to buy groceries as they are much cheaper there compared to Cherokee. Rented this property on another home rental site. Cannot leave review because their listing expired. The whole house needs to be deep cleaned, the screen doors need replacing, some new dishes, bath mats and a new couch cover to replace the duvet they use to cover the dirty couch. Bugs can be very bad, there is no way to avoid them. By the end of my stay (2 weeks) I was covered head to toe with bites from mosquitoes and I don't know what else. The room downstairs, under the main house, was musty smelling. Kayaks were difficult to get in/out of water but we did it. WiFi worked, refrigerator small, bring a cooler and ice. The dishes were not very clean and the only salad bowl had a big crack in it. The bedding was old and thin and I didn't tell my husband, but under the sheets where an awful old mattress cover and an old dirty blanket. We were there two weeks and they never came to clean up or bring new towels. I had to ask for them for towels after we were there a week. There was a washer and dryer on site, but we were asked to go to Cherokee to wash our cloths. We were told not to use the generator unless it was an emergency. Because the house ran on solar we had a couple mornings we couldn't even brew a pot of coffee. After about 4 days of that, we were told via some email communications with the owner we could run the generator for 30 minutes in the morning and 30 minutes at night. The lantern we were told to bring D batteries was not there. We got tired of the way they asked us to do the dishes so I found a better way. We were asked not to use very much electricity so I felt like the energy Nazi for the whole 2 weeks. Also, we were asked to conserve water, which is hard for that big of a house. I have been visiting Abaco for almost 20 years and I would not stay at this villa again nor recommend it. I agree with another reviewer who said they need to reinvest some of the rental money back into the house and do a deep cleaning. The small issues add up to make for a poorly run property. This was our second visit to Backroads and I would highly recommend it as a great getaway. We saw sea turtles in abundance, tiger rays, parrots and other tropical birds and fish and also a stingray at Cherokee village. A beautiful beach was a short kayak ride away, we cycled over to Petes Pub and gallery and toured the foundry which is all run on a generator. A highlight of the visit was a day trip to Hopetown by ferry where we rented bikes for 12$ for the day and explored the charming village, lighthouse and had a great lunch at the Abaco Inn. As an artist I appreciated the spectacular views in all directions and natural unspoiled beauty. As there is no light pollution the night skies are some of the best for star gazing. We are looking forward to a return visit. The Bahama Backroads is located in the seaside village of Little Harbour, which includes a pub-restaurant, gallery and foundry where marine sculptures and jewelry is made. There are various beaches and uninhabited islands to explore. There is also a championship, oceanfront golf course nearby as well as superb fly and deep sea fishing.